Flow measurement R&D specialist TUV SUD NEL has announced an investment of £1.45 million (almost €1.7 million) in a large capacity test separator for its new Advanced Multiphase Facility (AMF). 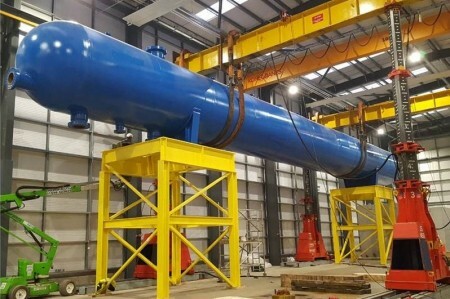 The separator will test multiphase and oil, water and gas flows and will ensure sufficient retention times even at high flow rates, according to the company. At a weight of 270 tonnes and a maximum operating pressure of 150 bar, the separator will enable flow rates up to 20 times larger than any other test facility in the world. With a total investment of £16 million (€18.6 million) the AMF test facility will focus mainly on the subsea sector and wet gas business. In addition to industrial testing, it will offer training programmes and academic research opportunities, as well as the addition of at least 17 new jobs. Scottish Enterprise has provided £4.9 million (€5.7 million) in R&D funding, with TUV SUD NEL parent company TÜV SÜD AG investing an additional £11.1 million (€12.9 million).